The Mannich reaction is an organic reaction used to convert a primary or secondary amine and two carbonyl compounds (one non-enolizable and one enolizable) to a β-aminocarbonyl compound, also known as a Mannich base, using an acid or base catalyst. the primary or secondary amine or ammonia – employed for the activation of formaldehyde. PHASE 1. Formation of iminium ion between the formaldehyde and the amine. A lone pair of nitrogen attacks carbonyl carbon. 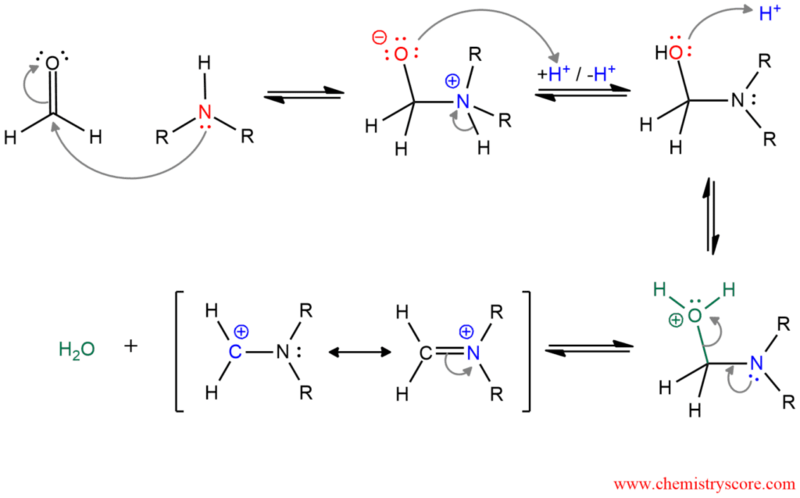 Then, deprotonation of nitrogen removes the positive charge, and protonation of oxygen remove the negative charge and the neutral intermediate is obtained. But the protonation of hydroxyl group yields a better leaving group which is expelled in the next step. A resonance-stabilized ion is obtained. PHASE 2. Enolization of ketone. Ketones, as well as all carbonyl compounds, can tautomerize to the enol form. The oxygen of keto form is protonated and α hydrogen is removed to form an enol. PHASE 3. Formation of the Mannich base. The enol intermediate then attacks the iminium ion and the resulting species converts to the Mannich base by deprotonation.